Guiybiebe Sees for the First Time in 9 Years! I am 46 years old and went blind about 9 years ago. I use to be seller of vegetables, but when I lost my sight I became jobless. My husband left me because, to him, I had also lost my value to work and lost my beauty with the fully white-covered cataracts that veiled me from seeing the world. Our only son, who is now 35, returned home to our village to care for me. He never married because helping and providing for me became a full-time job. Even though I lost my sight, my job and my husband, I never lost my love for Jesus. Through Him, I drew strength and in Him, even in blind darkness, I could still feel the light of His love. I still sang His praise and worshiped Him as my Lord and Savior. I couldn’t see myself smile, but could feel it on my face even during the darkest of times. My son heard the message of the village Chief, that Sight.org was coming to our area to help restore sight to those blinded by cataracts. 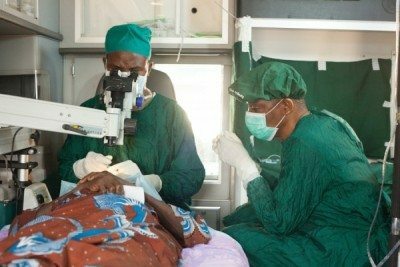 While my son went to work, he arranged a village neighbor to bring me to a patient screening to see if I qualified for the FREE surgery Sight.org was offering. I had not heard anyone call me beautiful in almost 10 years. The translator then told me that with my permission, not only would they help one eye, but they could help both because I was so young. It was up to me to agree. That question was easy to answer. I could only see the hint of light, which made the simplest tasks like dressing and feeding myself impossible. The day of my surgery, as I sat in the preparation area, there was gospel music playing in my local language. It put me at comfort to feel so much compassion from the team of Sight.org. They even prayed with me before I went into the surgical ambulance. Then during recovery they provided me a sleeping area because my village was too far to travel back to on the same day as my surgery. I prayed all night in anticipation of seeing the sun again. When they removed the eye patches, I saw myself for the first time in ten years. I recognized the voice of Laurie, the eye team medical provider, who had called me beautiful just five days ago in a patient screening. She showed me a picture of myself with her cell phone camera. All I could think about was the beauty that had been brought back into my life. No longer would I be a burden to my son. Not only was I free from blindness but he was free to live his own life now, marry and have children of his own. I could go back to work, feed, and clothe myself. I thank God. I thank Sight.org. I thank the sponsor who all gave me more than sight back! They gave me life back! Below are two videos of Guiybiebe seeing and reading for the first time in 9 years! 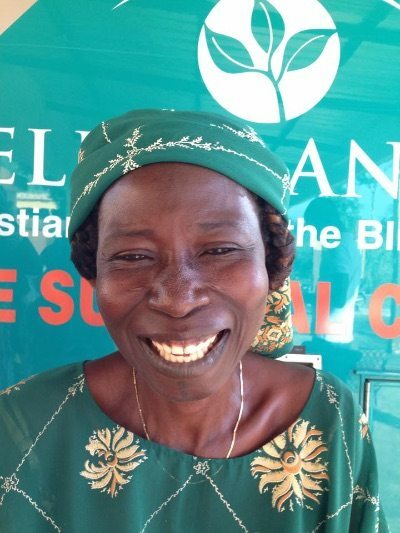 Thank you to our sponsors for being a part of giving her sight!